Established approximately 1828 - 1831. 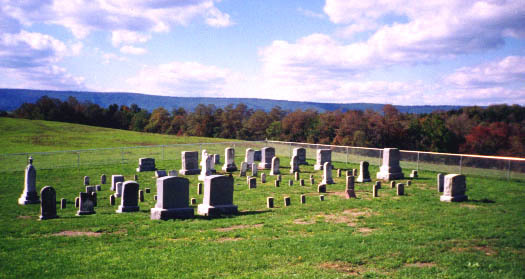 About 40 years ago the Fletcher Cemetery was in a condition similar to that of many family graveyards in Bedford County and almost any rural community in our country today. Having been somewhat neglected over it's more than 125 year lifetime, in the early 1960s, the cemetery was unkempt with tall grass and sumac, sassafras, and locust trees growing among the stones as nature tried to reclaim it. Some rural cemeteries of this age are forgotten and pass out of memory, but the descendants of those buried here determined to use a weekend to try to restore a portion of it. After spending this time several members of the group decided that maybe another weekend could be used to continue the work in another part of the cemetery. This weekend job grew into something much larger. The Herman Barkman Family - Floyd, Donald, Charles, Melvin Mills, Gladys, Reba, and Sara, met at the Fletcher Cemetery May 16, 1963, for the purpose of cleaning up the old Barkman graves, which they did that evening, but when we were coming out of the gate, Sara says I hate to clean up Grand Pa's people's graves and not clean up Grand Ma's people's graves, and Don says where is Grand Ma's people, so Sara told them or rather showed them, and they all agreed to set another evening to clean Grand Ma's people('s) graves up. So we set one week later. We all got busy picking stones, raking, and carrying stones away. Walter Bowman tore up the ground with his tractor, and Donald Barkman pulled the big locust trees and sassafras bushes with his tractor, and soon it was looking different, and we were off to a good start. Then next year in May we set a date May 17th to elect officers and how to raise money. Our goal was $2000.00 and we all got busy asking relatives and friends for money, and soon we reached our goal. This is how we got started to clean up the Cemetery. Thank God for all of those who helped in any way. It took to May 24th 1974 to finish it. Thank God for the faithful ones, who stuck to the finish. We are real proud of it. I could have almost shouted. Sara Mills, Sec. & Treas. The money raised allowed for the replacement of the old fence and gate. It also provided for timely maintenance of the cemetery grounds. The Fletcher Cemetery again became a place that family members came to regularly, knowing they would find it freshly mowed and pleasing to see. By 1998, the "new" fence of 1964 which required painting every 4 or 5 years, was nearing the end of it's service. Some of those same folks who had seen the need in 1964, decided that the old fence once again needed to be replaced. A study revealed that a new type of fence is now available that will require minimal maintenance and is guaranteed for a period of 50 years. A committee was soon formed and with enthusiasm reminiscent of earlier years, the task was begun to raise the money. In 1964, the contributors had mostly been local family members who were direct descendants of those buried in the cemetery. In 1998 it was thought that it would be nice to distribute a pamphlet that briefly described the Fletcher Cemetery and the Fletcher Ancestory. Perhaps those local family members would enjoy learning and reminiscing about their ancestors and their ancestors' family history. The task of providing a mini - genealogical outline of the Fletcher Family Ancestory starting in 1700 in the area of southwestern Germany extending to the descendants of those buried in the Fletcher Cemetery was expertly done by David Fletcher who is a 4th great grandson of the Jacob Fletcher (1742/43 - 1831) buried in the Fletcher Cemetery. David Fletcher (DayvidA@aol.com) is currently residing in Richmond, Virginia.